If you are looking for a circular saw then any DeWalt product is going to be a good place to start your search. If you are familiar with the tool industry, you are probably aware of them. Their name in the power tool game is huge, probably largely because of tools like this one. 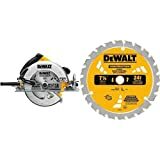 The DWE5678sb is going to appeal to people looking for a lightweight (in this case, 8.8 pounds) saw that is still able to utilize a lot of power. We will get into a deeper analysis of this tool as the article progresses, but we can say quickly and without hesitation that there is a lot to like here. The user-friendly design, the compact quality build, the 15-Amp motor, and the 57-degree bevel capacity, all add to this tools favorable design. There are mediocre aspects as well. For instance, we noticed that the blade adjustment is somewhat off from the moment you take it out of the box. This can be fixed with a little maintenance, but who wants to do that with a new tool, right? We’ll get into the highs and lows of this tool more in the review itself. Read on! By virtue of the fact that this is a power tool, power is an important component of any and every circular saw. The good news is that in this case, DeWalt does not disappoint. The 15=amp motor that you get with this model is optimized for appropriately handling all of the tasks common to a circular saw for an at home or do-it-yourself project. In the case of the DWE575sb, the 15-amp motor is able to produce an impressive 5800 rotations per minute. While RPMs do not necessarily always measure or indicate the level of power that you can expect to get with a product, they certainly are helpful. A high level of rotations per minute is going to help ensure that you make clean, consistent cuts every time, even when you are working with harder materials. The lightweight and compact design that is at work here are beneficial for the exact reasons that you would assume they would be. Working long hours on the job will naturally cause fatigue, exhaustion, and even pain to set in. Having the opportunity to use a tool that is designed to be lightweight can go a long way towards mitigating those problems. While circular saws aren’t carried quite as much as say, a power drill, you are still going to be moving yours around quite a bit during more intensive projects. When that is the case, you will be glad to have something with a lightweight design. This tool is also just built very well. Anyone that knows power tools knows that this is a design feature that isn’t anything to sneeze about. The durable exterior that is at work in the DeWalt DWE575sb is going to help to ensure that your tool is not likely to get damaged while tackling difficult tasks on the job site. When trying to make the most accurate cuts possible, the dust blower is a truly critical feature to have at your fingertips. If you are unfamiliar with the mechanics of this feature, have no worries because it is pretty simple. Using a very tiny vacuum mounted near the blade, the tool continuously ensures that no dust or debris is in the way of your cutting line. The advantage is a relatively small one, but if you value the quality of your work like we are sure you do, you are probably going to appreciate every bit of help that you can get to make the job a little bit easier. All DeWalt tools feature a 1-year warranty, which also includes free repairs and maintenance for qualified issues you might encounter with this tool. Is this tool suitable for beginners? That’s a good question because there are certainly some power tools that aren’t. While this tool may not be good for everyone, the design is pretty user-friendly which means that even if you don’t have a lot of experience, you shouldn’t have much trouble figuring it out. Is this tool really durable? While we are not trying to make the claim that this is an industrial level circular saw, there is still much to like about the durability of the tool. Most hobbyists or at home users will find it quite durable. The user impressions for this tool overall are extremely positive for the most part. While a few users have reported that the blade isn’t set quite right (an issue that we also noticed) most feedback that we have received is more focused on the tool’s positive components. Users appreciated the lightweight build, the impressively powerful motor, and perhaps especially, the user-friendly design concept. The general consensus is that there is much to be liked here. And there you have it! You have read your review and now you have to decide whether it is worth your money to buy this tool. While we would never go so far as to tell you how to spend your money, we can remind you of some of the things that make this tool so impressive. The DWE575sb is powerful, lightweight, durable, easy to use, and it even has the benefit of being fairly affordable. If these qualities are important to you, we highly recommend giving this unit a try.